Moroccan pastries, like ghriba, are small, bite size gems of deliciousness. Most have nuts, usually almonds, honey, and powdered sugar. Sadly, the majority also have wheat making them off-limits for us. Ramadan is right around the corner and I have been re-making all of our favorite treats into gluten-free replicas. Are you ready for a ghriba-a-palooza? I’ve created four new ghriba recipes that I’ll be sharing over the next few days. I think you’ll have a hard time choosing your favorite! Ghriba are one of the most well known Moroccan cookies. They are easily identified because of their cracked surface – a must in ghriba making. They tend to be a bit crunchy on the outside but chewy inside. Most of the time they’re made with almonds, but can be made with walnuts, peanuts, really any kind of nut. When I started developing a recipe for gluten-free ghriba I first looked to traditional recipes. There are some gluten-free recipes that exist but I find it easier to try and convert from a recipe with gluten to gluten-free. The problem here was there are a lot of different ways people make ghriba! Some used butter, some oil. Some caster sugar, and some powdered sugar. Some used semolina, or white flour, or coconut. Some people make ghriba and put jam in them, like thumbprint cookies. Basically there was no real base recipe to start from. Maybe that’s a good thing? 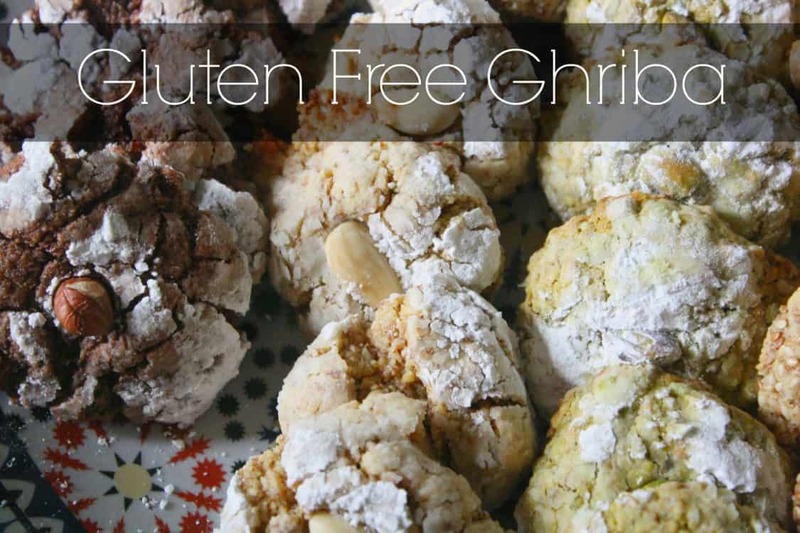 I came up with four new kinds of ghriba – all of them are gluten free. 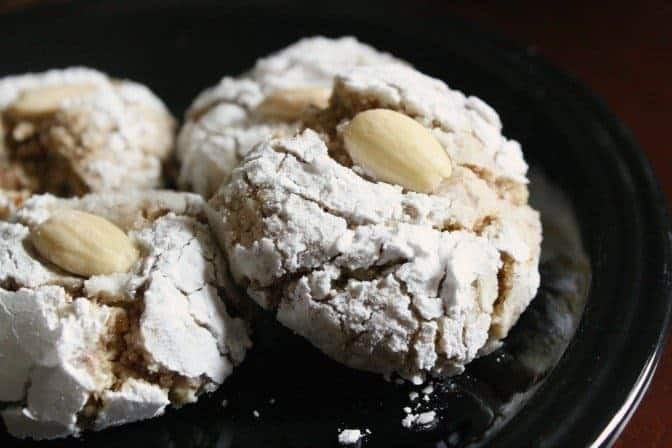 Today I’m sharing the recipe I created for Lemon Vanilla Almond Ghriba. I promise to share my recipes for all of the others, if you’re following me on Facebook or subscribe for updates (sign up is on the right sidebar), you’ll know as soon as they’re up! In a large bowl combine almond flour, granulated sugar, and baking powder. Add to the dry ingredients the preserved lemon juice (or lemon zest), vanilla extract, and egg yolks. Break up the butter with your hands or a pastry cutter and begin working into the dough. Using your hands or pastry cutter mix all of the ingredients until everything has been combined, the dough will feel slightly sticky. From small balls with your hands, about 1" in diameter. Coat the balls with powdered sugar and place onto a cookie sheet or plate. Refrigerate the cookies for 30 minutes, or place in freezer for 10 minutes. Arrange cookies on baking sheet and gently press an almond into the top of each. Do not flatten the cookies, they will naturally shape. Bake for 10 - 12 minutes. The cookies should still be a pale color. Leave on the baking sheet for 5-10 minutes to allow the cookies to finish setting, then transfer to a cooling rack. When the cookies are completely cool, transfer to an air tight container. Cookies can be stored on the counter for 1-2 weeks, or in the freezer for up to 3 months. To serve, remove from the freezer and allow to warm up before serving. The dough for these cookies MUST be refrigerated or frozen before baking to prevent them from melting. I love nut cookies, so I’m loving the sound of these. Can’t wait to try them! 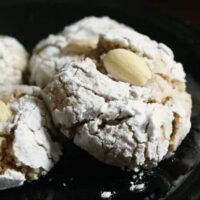 I love almond cookies, and your flavor-combinations are wonderful – I can’t wait for the next recipe! Ooh these look so so good!I love the vanilla lemon flavor and the use of Almond flour! !Seems like a great treat for anyone 🙂 Love the other flavors combos too! I’ve never heard of ghriba, but all your options sound wonderful. Such a excellent option for a gluten free treat! Your cookies are beautiful and I love the flavors of them! I love coming to your blog every week and learning more about Moroccan cuisine! These look delicious and i can’t wait to see the rosewater pistachio version. Two of my favorite flavors! This classic cookies just made my to do list for tomorrow. I´ve never heard of these cookies, but they are so the kind of things I like to eat and bake! Gluten free is a bonus. And you reminded me I need to make preserved lemons too. I have not heard of ghriba until now. I love that cracked surface and powdered sugar coating. It’s a cookie I certainly want to try one day. I have never heard of ghriba before but am so glad to have discovered them today. These cookies look positively irresistible! Yummm. Crunchy on the outside and chewy on the inside – with almonds no less. What a fabulous cookie. And you’ve concocted not just one but 4 versions which are gluten-free. Bravo, Amanda! Wow! I have never heard of ghribas before, but I am intrigued. This looks fantastic! I’ve found them in a few other cultures too – I believe there’s an Indian version called the same things but it may be just in a single region.